Composite image of the Cigar Galaxy (also called M82), a starburst galaxy about 12 million light-years away in the constellation Ursa Major. The magnetic field detected by SOFIA, shown as streamlines, appears to follow the bipolar outflows (red) generated by the intense nuclear starburst. The image combines visible starlight (gray) and a tracing of hydrogen gas (red) from the Kitt Peak Observatory, with near-infrared and mid-infrared starlight and dust (yellow) from SOFIA and the Spitzer Space Telescope. Credits: NASA/SOFIA/E. Lopez-Rodriguez; NASA/Spitzer/J. Moustakas et al. The Cigar Galaxy (M82) is famous for its extraordinary speed in making new stars, with stars being born 10 times faster than in the Milky Way. Now, data from the Stratospheric Observatory for Infrared Astronomy, SOFIA, have been used to study this galaxy in further detail, revealing how material that affects the evolution of galaxies may get into intergalactic space. 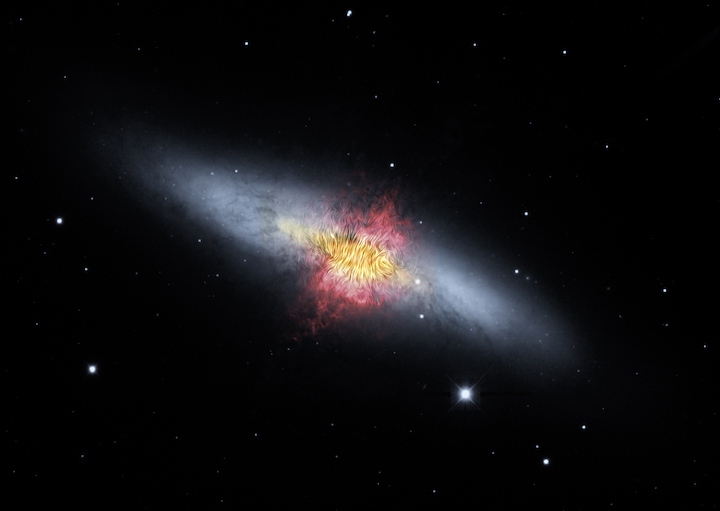 Researchers found, for the first time, that the galactic wind flowing from the center of the Cigar Galaxy (M82) is aligned along a magnetic field and transports a very large mass of gas and dust — the equivalent mass of 50 to 60 million Suns. Besides being a classic example of a starburst galaxy, which means it is forming an extraordinary number of new stars compared with most other galaxies, M82 also has strong winds blowing gas and dust into intergalactic space. Astronomers have long theorized that these winds would also drag the galaxy’s magnetic field in the same direction, but despite numerous studies, there has been no observational proof of the concept. Researchers using the airborne observatory SOFIA found definitively that the wind from the Cigar Galaxy not only transports a huge amount of gas and dust into the intergalactic medium, but also drags the magnetic field so it is perpendicular to the galactic disc. In fact, the wind drags the magnetic field more than 2,000 light-years across — close to the width of the wind itself. These observations indicate that the powerful winds associated with the starburst phenomenon could be one of the mechanisms responsible for seeding material and injecting a magnetic field into the nearby intergalactic medium. If similar processes took place in the early universe, they would have affected the fundamental evolution of the first galaxies. The results were published in January 2019 in the Astrophysical Journal Letters. SOFIA’s newest instrument, the High-resolution Airborne Wideband Camera-Plus, or HAWC+, uses far-infrared light to observe celestial dust grains, which align along magnetic field lines. From these results, astronomers can infer the shape and direction of the otherwise invisible magnetic field. Far-infrared light provides key information about magnetic fields because the signal is clean and not contaminated by emission from other physical mechanisms, such as scattered visible light. The HAWC+ instrument was developed and delivered to NASA by a multi-institution team led by the Jet Propulsion Laboratory (JPL). JPL scientist and HAWC+ Principal Investigator Darren Dowell, along with JPL scientist Paul Goldsmith, were part of the research team using HAWC+ to study the Cigar Galaxy. SOFIA, the Stratospheric Observatory for Infrared Astronomy, is a Boeing 747SP jetliner modified to carry a 106-inch diameter telescope. It is a joint project of NASA and the German Aerospace Center, DLR. NASA’s Ames Research Center in California’s Silicon Valley manages the SOFIA program, science and mission operations in cooperation with the Universities Space Research Association headquartered in Columbia, Maryland, and the German SOFIA Institute (DSI) at the University of Stuttgart. The aircraft is maintained and operated from NASA’s Armstrong Flight Research Center Hangar 703, in Palmdale, California.